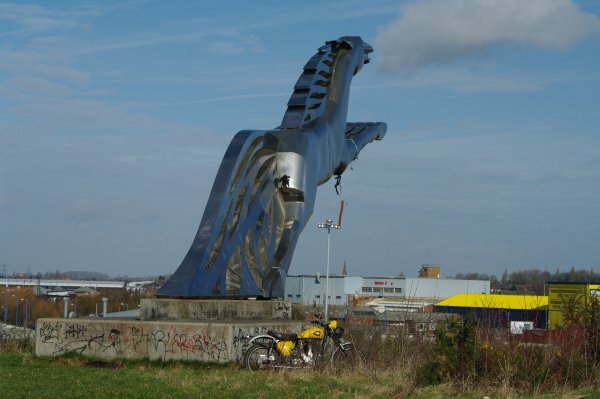 Took the 30-bobber up to Wednesbury and got some photographs of Sleipnir, then carried on around the Severn Valley. Popped into Bridgnorth station for a cuppa and a Crunchie - was quite surprised at the number of "steam anoraks" wandering about. Ah - what's that big, blue steamy thing ? "Sir Nigel Gresley" That would account for it. Came back and decided to make a start on the tiger coloured trike - ah, the air line doesn't reach the top garage. Off to Aldi for a 15 metre, wall mounted, retractable air line. That one does the trick. DOT is now living under the kitchen window for a while. I did the left hand suspension on the TCT - moved the swing arm by one spline. Will do the other side tomorrow - possibly.